Get started and build more trust for your shop. Build more trust for your shop. Reduce your bounce and return rate with product reviews. Simply everything: including the traffic package. The Trustbadge® is the “trust centre” of your online shop. 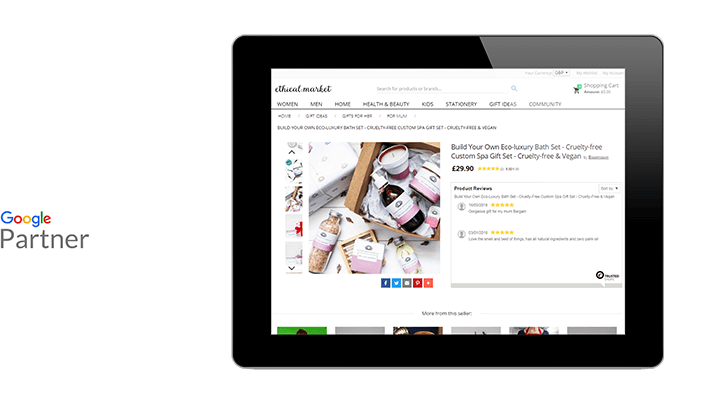 From a technical perspective, it’s incredibly fast and easy to integrate into your online shop - and with some shop software, it can be done with just a few mouse clicks. The Trustbadge® was also designed to be mobile responsive, meaning it will look great whether viewed on a desktop, a tablet or a smartphone. 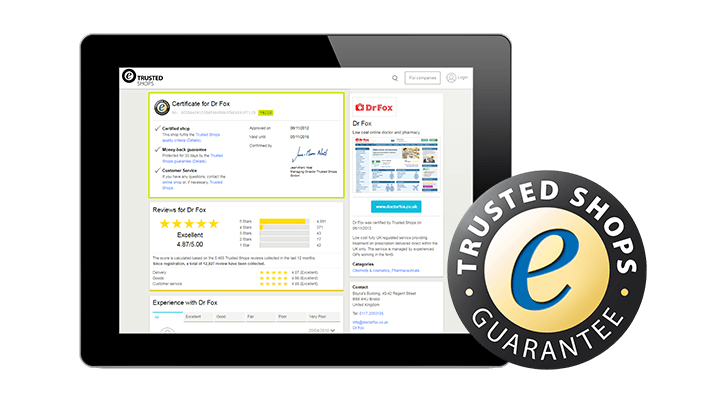 Depending on the package you get with Trusted Shops, the Trustbadge® will reflect that. If you end up adding the trustmark later, no problem. It will be added to the Trustbadge® automatically. What else? The Trustbadge® will also offer your customers the option to opt into the 30-day money-back guarantee upon checkout. Want more? It will also help you collect more reviews! Set up the Trustbadge® to send out review requests at a specified time after customers have received their items. You can also set up an exit-intent pop-up, which offers visitors a discount if they’re about to exit your shop without completing a purchase! As an online business owner, you’ve got a seemingly endless amount of tasks and responsibilities to take care of: online marketing, logistics, shop software, let alone the legal issues that you’ve got to stay on top of. We, at Trusted Shops, are well aware of the difficulties of running a business and that’s why we want to support you as best as we can. 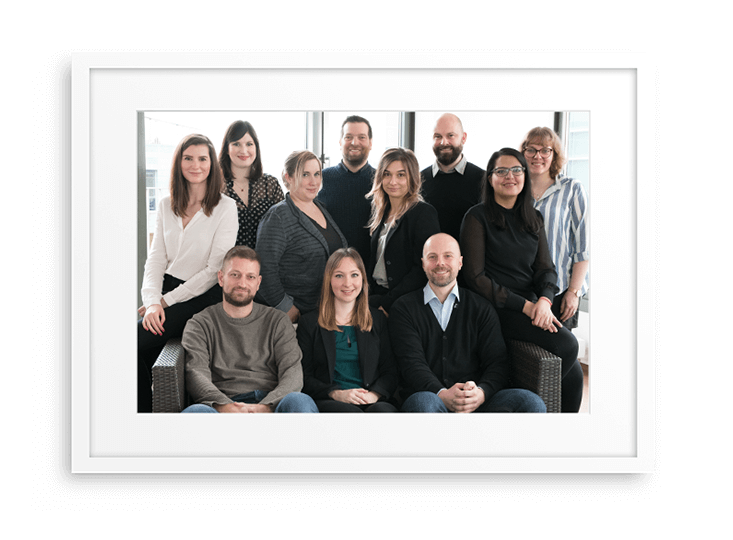 When you become a Trusted Shops member, you’ll get matched with a personal contact person from our Customer Success team within seven business days. They are there to help you integrate the Trusted Shops solutions you’ve booked so that you can get started as quickly as possible. However, they’re also there for you in the long-term. Anytime you have a question, reach out either per e-mail or by telephone. Our phone services are open between 8:00 and 17:00. For shops that pass our audit process, the Trusted Shops trustmark (our famous seal of approval), makes a strong impression at first glance. By offering a 30-day money-back guarantee, the risk on the customer is minimised. Your customers will feel at ease knowing that if something does indeed go wrong with their order, somebody has got their back. This feeling of security is reinforced during the checkout process as well. And with the Trustbadge technology, integrating the trustmark is simple and quick. With our “Review Service”, we rely on a balanced mix of manual and automatic cross-checking. Any discrepancies are forwarded to our expert team. Naturally, shop owners have the option to report questionable reviews to be double-checked. 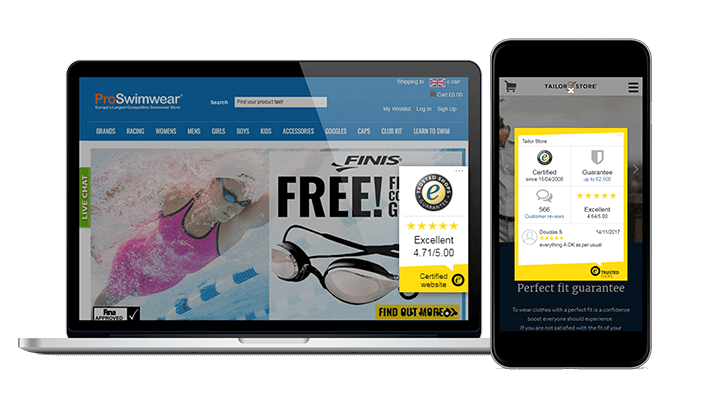 In addition to our Trustbadge® technology, we offer visually customisable review stickers or API access to display your star-ratings right on your website. On top of the analysis tools at your disposal, the backend gives you the opportunity to react to reviews directly and show off the quality of your customer service. Use the opinions of your customers to promote your products. With this “user-generated content,” you can expand on your product descriptions with credible and authentic customer feedback. Shop visitors can get a more accurate idea of what they’ll get from your products. A typical effect from this is that your return rates will lower due to having well-informed shoppers. Expand your Trusted Shops profile page by integrating a button leading to a landing page of your choice. Use the “exit-intent” pop-up to entice visitors ready to leave your page by offering them a discount. You can also offer customers who have left a review an additional discount on their next purchase, helping to turn them into repeat customers. Would you rather give us a call instead of writing us a message? We’d be happy to consult with you. Our experts can help you figure out which trust solutions fit the needs of your business and provide you with a customised offer. Of course you’ll receive an email with further instructions. Want to know how to proceed now? With our different packages, you'll get different features. As a member, Trusted Shops will be home to all your trust-building tools. Join the circle of trust! It starts with a one-time £99 fee. The monthly fee will depend on your annual sales. Contact us for a free consultation! If you don’t want to offer your customers the trustmark with the money-back guarantee, we can also offer you our reviews products separately. Included in the price is support for “responsive” designed shops. We also offer SDKs for iOS and Android. Want to log in to Trusted Shops while you’re on the go? Download the Trusted Shops app. Other domains, features and options? In “My Trusted Shops” you can book, unsubscribe and manage your products. Want to test out the trustmark? Unfortunately, we can’t offer that. Auditing and certifying websites that want to show off the trustmark takes a lot of manual work. Debit, PayPal, and credit cards. If you pay annually, we can offer you a classic invoice. Terms and conditions of the Trusted Shops protection from "Abmahnungen"